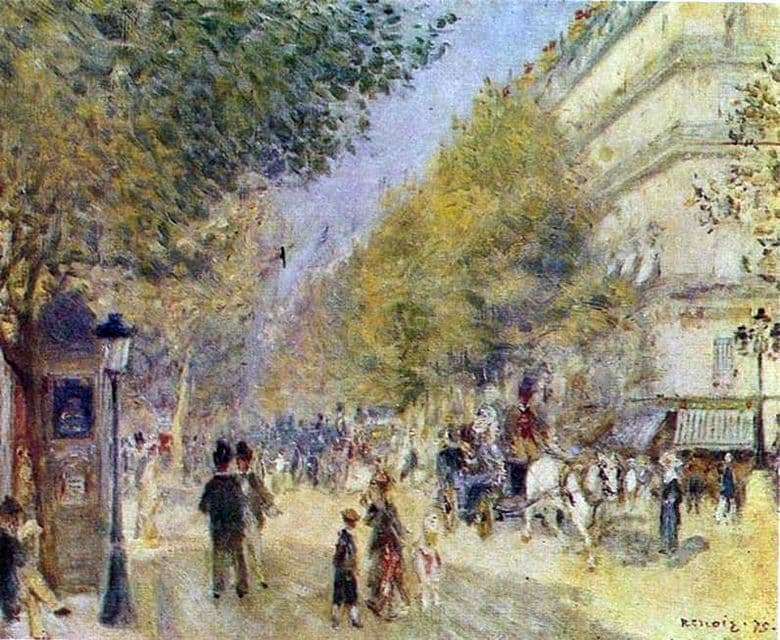 The canvas of the famous French painter Pierre Auguste Renoir conveys the landscape of one of the streets of Paris. The picture is filled with sunlight illuminating the entire street and people passing by. On the right side of the art is a massive bright building. The picture is painted in the style of impressionism, therefore, according to this stylization, all objects are not extremely detailed. The windows and depressions of the building are drawn only by alternating light, light and light strokes, and weak inclusions of vegetation are traced on the roof of the building. Most of the structure covers a series of trees. They consist of a duet of delicate yellow and green. Tree branches are depicted randomly, and the tops are directed straight to the sky. Expressive brushstrokes make plants look like flames, looking up – this is reminiscent of trees from Vincent van Gogh’s canvases. In the central part of the picture is a collection of people seeking somewhere for their business, walking along a light asphalt road. It depicts a woman with two children, and two men leading a conversation, and a carriage with beautiful white horses. The crowd consists of a variety of people, differing from each other in age and classes. In the distant part of the canvas, brushstrokes are outlined hinting at the crowd moving forward. A large part of the left side of the picture is covered with leaves of a tree with a thin trunk, in the color scheme of which a dark green color prevails, smoothly shimmering in golden and white. In contrast to the group of trees located on the right, the leaves and contours of the tree are traced more clearly. Near the tree is a black lantern, the outlines of which are clearer than the rest of the paintings. On the right side of the piece, there is another flashlight. The location of these structures at a certain distance from each other gives the composition a greater volume and depth of perspective.